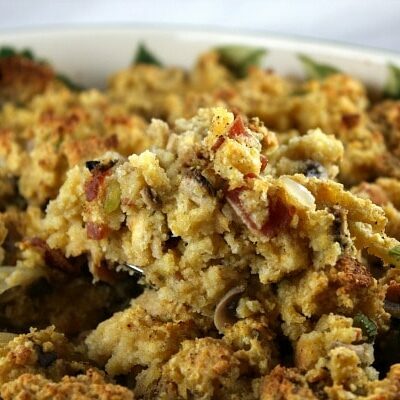 Cornbread and Gorgonzola Dressing is a delicious and unique dressing recipe that is perfect for serving with your poultry dishes. Serve it as a side to turkey, roasted chicken or Cornish Game Hens. It’s the perfect accompaniment! This recipe is definitely not your mainstream dressing recipe. It’s a little more gourmet than others. I like to refer to it as the dressing that adults who love food will enjoy. Picky adults usually don’t like gorgonzola cheese. Or some people just don’t prefer it. 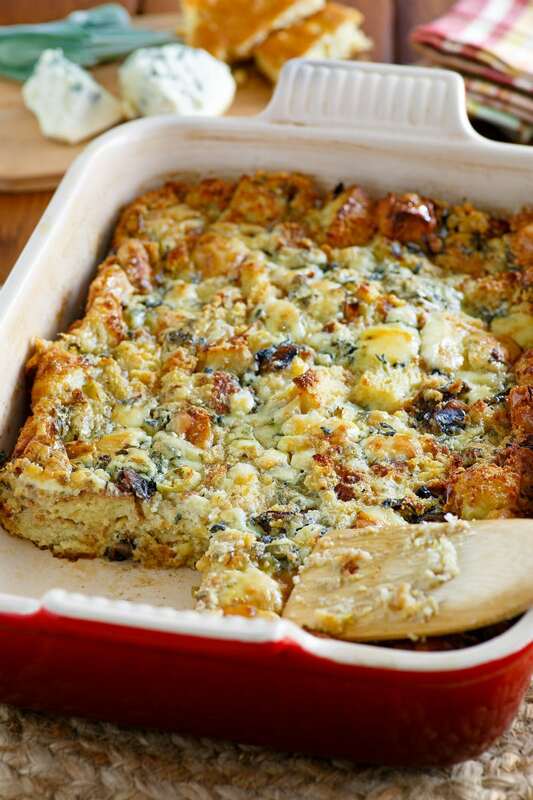 There is 10-ounces of gorgonzola cheese in the recipe, so the flavor is definitely there. 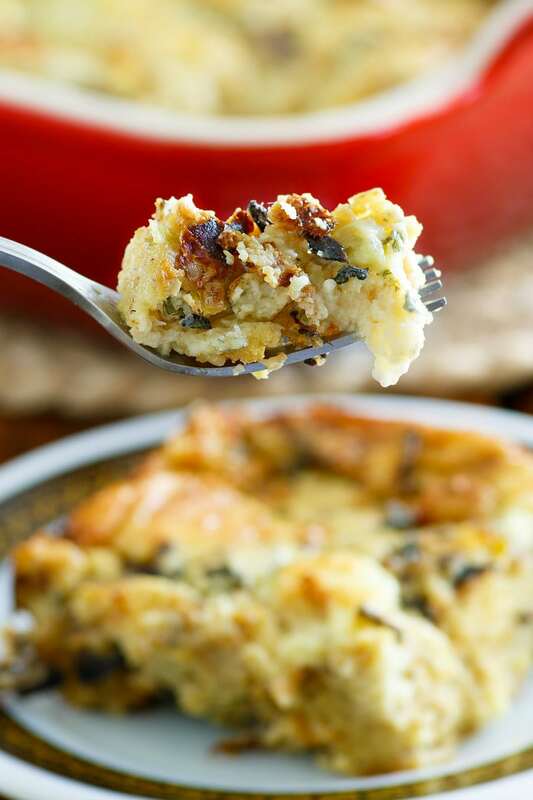 This recipe is for people who like gorgonzola cheese! When would be a good time to serve this recipe? This dressing is a special one. I’d save it for a holiday dinner- like Christmas, Thanksgiving or Easter. If you’re into Entertaining, you might consider serving it at a dinner party too. It’s one of those great side dishes that will likely be a big hit. 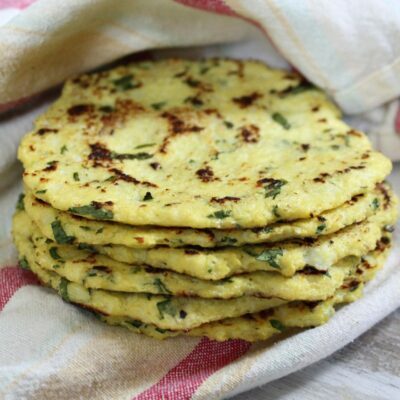 You probably have many of the ingredients called for in this recipe already in your refrigerator or pantry (things like butter, flour, cornmeal, sugar, milk, eggs and garlic). Items you’ll need to pick up at your market include gorgonzola cheese, dried porcini mushrooms, baguette, shallots, leeks and fresh sage. Part of those ingredients will create a cornbread that you’ll bake to be used in this Cornbread and Gorgonzola Dressing. All of those ingredients and flavors combined will be fabulous! 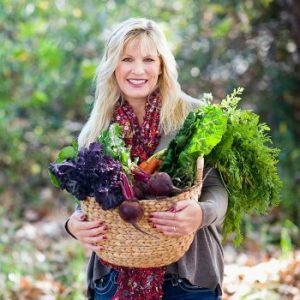 How do you make Cornbread and Gorgonzola Dressing? In this recipe, you’ll begin by baking up a simple cornbread. Dried porcini mushrooms are soaked in hot water, which creates an amazing mushroom broth. The mushrooms are sauteed with leeks, shallots, sage and garlic. And then that mushroom broth combined with eggs and milk is used to bring everything together- cornbread cubes, sauteed veggies, chunks of baguette, gorgonzola cheese. It’s spooned into a casserole dish and baked until golden and set (about 40 minutes). 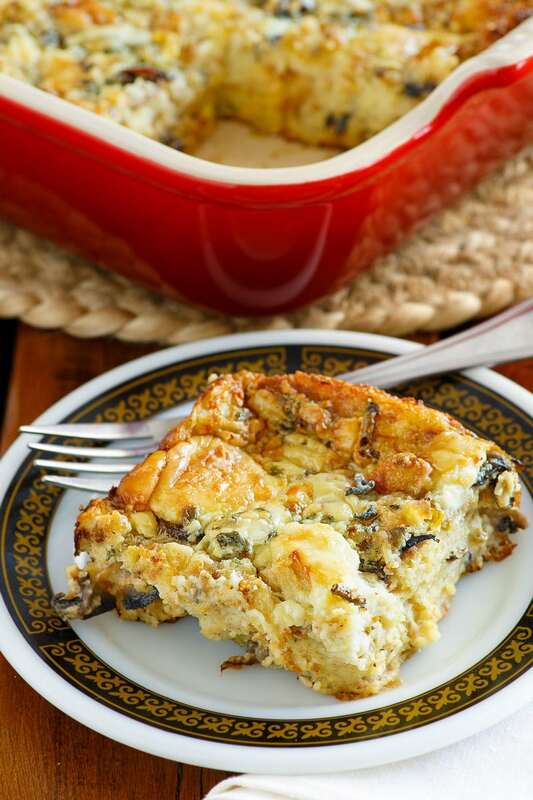 I love my Emile Henry casserole dish for this recipe and other 9×13-inch casserole type recipes. They sell it on Amazon, and it comes in yellow, red, green, white and blue! You can find it HERE (affiliate link). 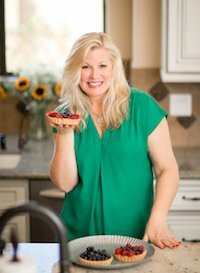 Can this recipe be prepared ahead of time? 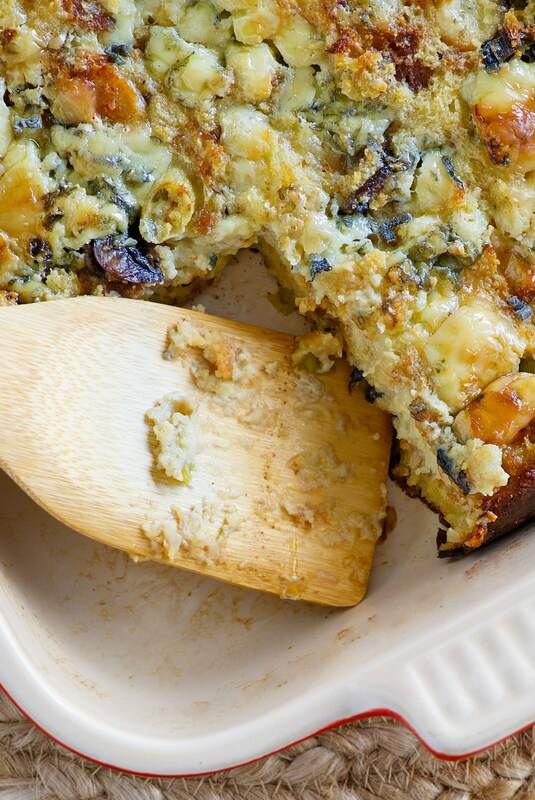 Yes, this Cornbread and Gorgonzola Dressing recipe may be prepared ahead of time. 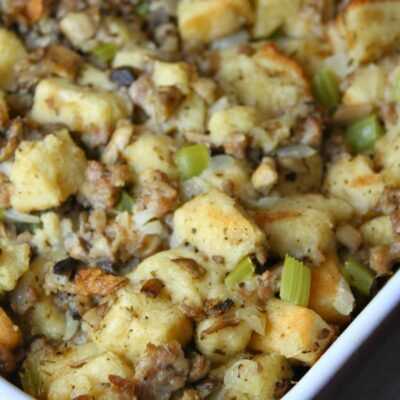 You’ll prepare the stuffing through step 2 up to one day before serving (see the recipe card below). Cover bread cubes and cornbread and store at room temperature; cover and chill the leek-porcini mixture, then bring to room temperature on the day of serving and before continuing with step 3. It’s pretty simple, really. The difference is how they’re prepared. 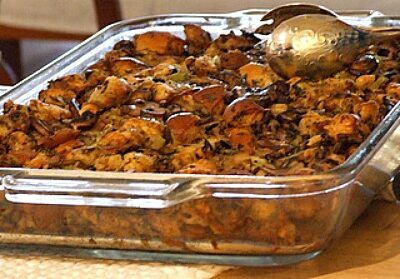 Stuffing is defined as a mixture to stuff another food- usually some kind of poultry. Dressing is generally cooked in a pan outside of the main dish. 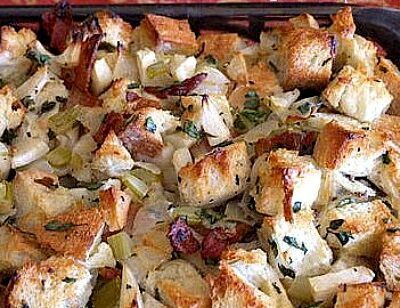 I have plenty of stuffing recipes, if you’re interested in checking out those. And another dressing favorite is my Dressing with Apples, Bacon and Caramelized Onions. 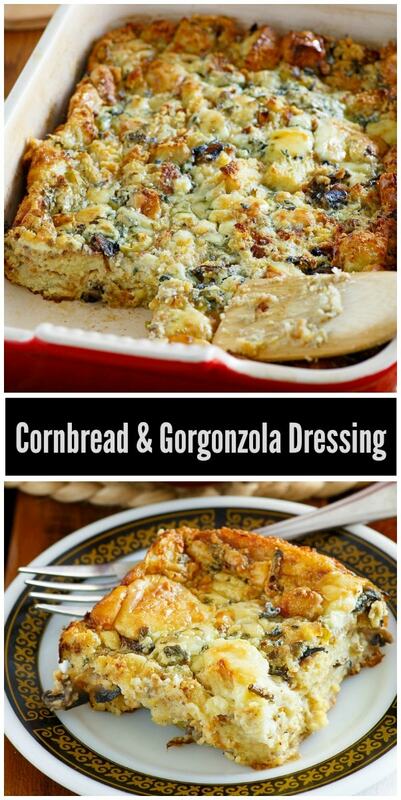 This cornbread and gorgonzola dressing is unique and delicious. I like to think of it as a grown-up version of dressing that true foodies will especially enjoy. Preheat the oven to 350°F. Butter two 9x13-inch baking dishes. In a large bowl, combine flour, cornmeal, sugar, baking powder and 1/2 teaspoon salt. Stir in 1 1/4 cups milk, 2 eggs, and melted butter. Pour the batter into a buttered baking dish and bake until a toothpick inserted in the center comes out clean, 30 to 35 minutes. Let cool and then cut cornbread into bite-size pieces. Meanwhile, in a small bowl, soak the porcini mushrooms in 1 1/4 cups hot water for 15 minutes. With a slotted spoon, transfer the mushrooms to a cutting board and roughly chop. Save the chopped mushrooms AND their soaking liquid. Melt 1/4 cup butter in a large frying pan over medium-high heat. Add the leeks, garlic, shallots, porcini, sage and salt. Cook, stirring, until the leeks and shallots are soft, about 5 minutes. Carefully pour in the porcini liquid, leaving behind any grit at the bottom of the bowl. In a very large bowl, whisk together remaining 4 cups of milk and 6 eggs. Stir in the leek mixture. Add the baguette cubes and stir. Add the cornbread cubes and fold gently to mix. 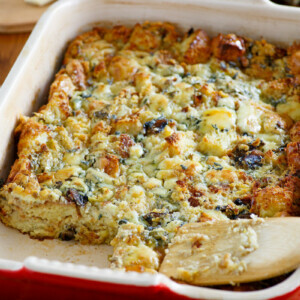 Transfer to the second buttered baking dish and scatter the gorgonzola crumbles over the top. Bake until set, about 40 minutes. Let sit 5 to 10 minutes before serving. Make-ahead tip: prepare the dressing through step 2 up to one day before serving. Cover the bread cubes and cornbread and store at room temperature; cover and chill the leek-porcini mixture, then bring to room temperature on the day of serving and before continuing with step 3. 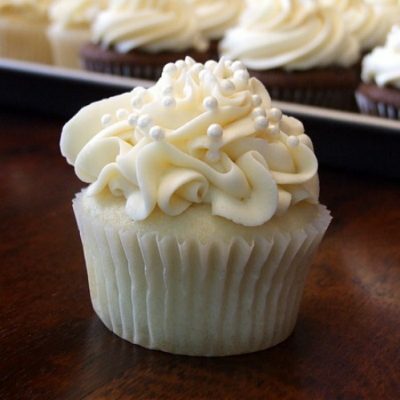 This recipe was originally shared in 2006. It was edited and republished in 2018.